Lately I've been a pretty lucky duck! 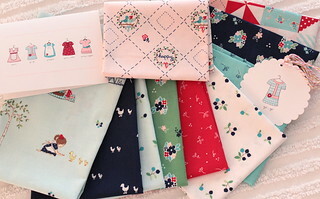 My mail brought me a couple of really cute packages from friends.. first up was this sweet little bundle of fabric from Tasha, fat quarters of her Country Girls Collection for Riley Blake. The timing is perfect, my block for the Sew Sweet Bee is due, and it's for Kerri. We're making Dutch Pinwheels in red, pink aqua yellow or navy, three colors and low volume backgrounds! I've got a good start there! 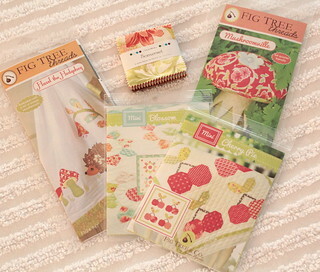 I also ordered a couple of cute patterns from Joanna over at Fig Tree Quilts. I fell in love with that mushroom and the hedgie tea towel just fell into my shopping cart. Joanna, being the sweetheart that she is, popped that Mini Blossom and Mini Cherry Pie in along with that little candy pack of Somerset, her newest line with Moda. Cherries! Mushrooms! Blossoms! What to make next? So many exciting choices! My day job is taking away from my sewing time right now. But I have all the 300 pieces cut out to sew on the weekend. A big quilt by Julie of @jaybirdquilts using Beauty Queen by Jennifer Paganelli and lots of low volumes!!! These look so cute Pam"
I am finally working on the Quilty Fun Sew Along (better late than never). I'm using my Pam Kitty stash and love how it's turning out! I'm working on ordering your newest collection this morning from my Schenck rep. I'm so excited to see it and only wish the wait wasn't so long until we get it. Our PK shelves at the store are painfully empty - so sad. Spending too much time looking at others work rather than doing my own! Lol. No I recently finished a little Gail Pan table runner and about to finish another.